Shanghai's air quality in January was the worst on record, city environmental officials said today. In the first three months of 2013, only 59 days - just under 66% of the total - were not polluted, officials from Shanghai Environmental Protection Bureau said. January was the "dirtiest" since the city started air quality monitoring, they said. Officials were speaking at the announcement of emergency mechanisms the city government will introduce on polluted days. Bureau staff said 10 days in the first quarter were classified as heavy polluted or severely polluted - the most serious in a six-level classification. Officials said the large number of polluted days this year is largely down to widespread haze covering much of China in January, together with the nation's adoption of a stricter air quality evaluation system. For the first time, this includes PM2.5 readings - smaller particles particularly dangerous as they can lodge in the respiratory system. "Under the previous system, 87 days - 96 percent of days - met the standard in the first quarter of last year, and there would have been 79 unpolluted days this year," said Wu Qizhou, vice director of Shanghai Environmental Protection. The bureau announced a detailed plan of measures to tackle high pollution levels on any given day. This includes a public alarm system, restrictions on industries and vehicles when the city is suffering heavy pollution and it is expected to continue, and closing schools. At times of severe pollution, high-emission vehicles will be banned from local roads and government bodies will stop running 30 percent of their vehicles. 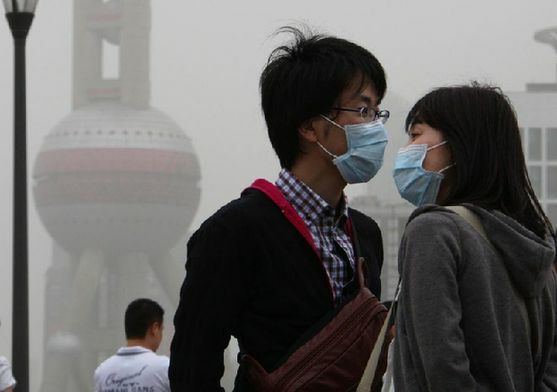 "If the pollution is extremely serious, the city government may order schools and kindergartens to close for the day and impose further restriction to vehicles," Wu said.